I wrote about the Ultra Repair Hydrating Serum a little while ago for my post on dehydrated skin, but I’ve tested it far more extensively since then and it most definitely deserves its own write-up. It’s made by First Aid Beauty, a US skincare brand who make very effective, yet easily tolerated products that are nicely priced. If ever I want something to target a specific skin concern – red, flaky patches, for example, or really tight and dry skin – then I find that this brand usually has something to suit. Skincare: do I really need to use a serum? I’m a serum fan and have been for quite some time, now. Read the post linked above if you need some convincing, but in a nutshell, I feel that serums usually provide a good, concentrated hit of active ingredients in a lightweight, suit-all formula. They are the shot of espresso in a big cup of milky, frothy coffee (forgive me if this analogy is wrong, I’ve never drunk a coffee in my life but it seems like a good comparison!) or the vodka in the – er – vodka cocktail. More often than not they are of a liquid, watery consistency, but sometimes face oil blends are called serums too. 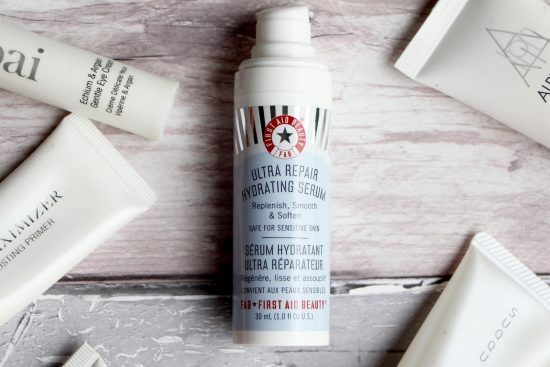 The Ultra Repair Hydrating Serum is a great, relatively inexpensive serum for those who want to start using a serum but don’t really know where to begin. It’s a water-based, almost weightless gel that slides on easily beneath your moisturiser and – though it doesn’t promise any ridiculous, overblown anti-ageing miracles – it takes brilliant care of the skincare basics. It tackles hydration (the serum contains hyaluronic acid and collagen), soothes irritation (colloidal oatmeal and allantoin) and helps to protect the skin from the daily onslaught of what the beauty industry has snazzily labelled “environmental aggressors” (pollution, cigarette smoke, etc). The fact that this serum is non-oily, hydrating and soothing makes this a great all-rounder; acne-prone skin that’s raw and irritated, dehydrated skin that’s on the oily side, skin that tends towards redness. You can’t really go far wrong. My own face is relatively “normal” at the moment – very slightly oily in the t-zone, sometimes tight and dry elsewhere – and the Ultra Repair works perfectly. It juices things up nicely, boosting moisture levels without adding a layer of “gunk” to my face, if I feel as though I want to keep things fresh and simple. If you hate having to wear layers and layers of product in the daytime then this serum works very well directly beneath foundation, if it’s a relatively nourishing one, or BB cream or tinted moisturiser. A brilliant “starter” serum, then, but this actually stands up to products that are multiple times the price, and I’ve found myself repeatedly reaching for it when I want something gentle and soothing to apply before moisturiser. Great for sensitive skin, oily skin, dehydrated skin and spot-prone skin that’s also all of the above, you can find it online (with full ingredients list) at LookFantastic here – it’s £26. I’ve just seen that there’s a dedicated serum for anti-redness – I haven’t tried this, and don’t suffer from redness, but if you want to take a look then it’s online here.